Introduction: TackleTog contributor and custom lure painter Brock Hiroshima reaches out overseas to connect with Manabu Kurita and discuss his world record tying Largemouth Bass and fishing for the forbidden species in Japan. On January 8, 2010, the announcement came from IGFA Headquarters in Dania Beach, Florida, that Manabu Kurita's 22 pound, 4.97 ounce largemouth bass from Japan was accepted as a tie for the official world record. B.Hiroshima: Mr. Kurita, thank you for agreeing to this interview. Might I ask, what is your earliest memory of fishing and who introduced you to the sport? M.Kurita: When I was 3 or 4 years old my grandfather used to take me skink and carp fishing, but I began bass fishing maybe 19 years ago. At that time, there were hardly any bass to be found in Japan, so my friend and I had to ride a bicycle 100km (one way) to fish for them. 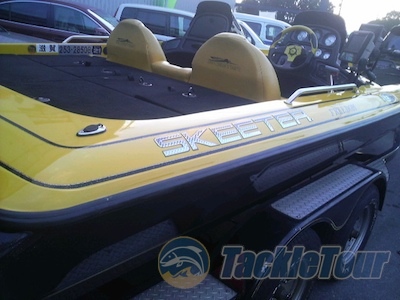 M.Kurita's ride is a black and yellow Skeeter. M.Kurita: About eight years ago. I am fortunate to know and look up to Mr.Okumura (Deps's president), Mr.Maeda (Pro Guide in Southern of Lake Biwa), Mr.Go (maker of the "Go-eel"), Mr.Yugo (Pro Guide in Northern of Lake Biwa), and Mr. Okuda (SIGNAL). I have received help from everyone. B.Hiroshima: With the growing popularity of tournament fishing in Japan over the years, have you ever competed, and are there any reason as to why you don't fish more tournaments? M.Kurita: Yes, I competed in a local tournament for one year. I think fishing tournaments takes a different mindset compared to chasing the record. Rigged and ready to go on another world record quest. B.Hiroshima: What kind of fishing pressure does Lake Biwa get on a given weekend? In other words, how many fishing boats, and has it increased since you caught the world record bass? M.Kurita: I think roughly 300 to 500 boats along with outgoing ships and bank anglers. I am unsure of the increase since the WRB was caught, but I am not worried about it. This was the previous Lake Biwa record fish mounted with Mother bait. B.Hiroshima: Are there seasonal migrations that you try to follow or do you try to fish certain big fish areas you know hold fish? M.Kurita: Yes, there are. In Lake Biwa, I think there are two kinds of giant bass, the bass of seasonal migrations and one that stays in a certain place. I try to look for either big bass using my intuition. B.Hiroshima: When you're chasing trophy fish what is your process and how do you mentally and physically prepare yourself? M.Kurita: 365 days a year, when I'm fishing, when I'm driving, when I'm with friends, I always think about a world record bass. Part of my preparation is making sure to always use new hooks and line. 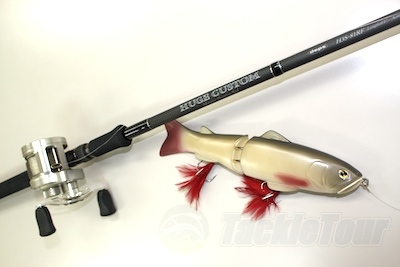 Deps Sidewinder The Bao Constrictor HGC-77XS rod, Shimano Conquest DC reel, and Deps Slide Swimmer 175. B.Hiroshima: On April 6, 2008 you caught a bass weighing 18.7 lbs (at the time, Japan's 3rd largest bass) on the Roman-Made Mother bait. Can you tell me about this experience? M.Kurita: One week prior to catching that fish I thought I would be able to fish for the World Record Bass. Three days before going out I prepared a scale for a fish over 1 meter. All day my concentration did not become interrupted even though I had to wait until the evening to go angling. The mother bait was made to swim around the 4 meter line over 7m of depth so this is where I fished it. After hooking the fish with my rod I felt the true sense of being alive. Fighting was done after 2 or 3 minutes, and then I landed the fish. 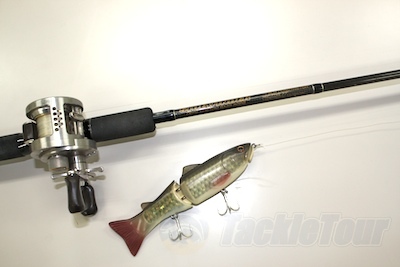 Deps Sidewinder The Dom Driver HGC-80XR rod, Daiwa ZDV reel, Deps Knucklearm, and Deps Slide Swimmer 175. 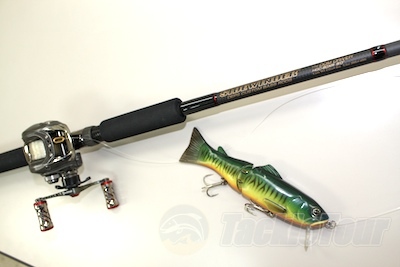 B.Hiroshima: What works better for you when chasing big bass, fishing slow or fast? M.Kurita: I believe both are important. It is hard to explain why, it really depends on the mood of the fish. B.Hiroshima: When do you decide to use live bait? M.Kurita: It is instinctive for me. I wait till I see the bass' reaction and then decide. I use live baits that I think the bass are eating each season, Gill and Sweetfish for example. B.Hiroshima: The day you caught the world record bass you said you saw a school of 20lb bass. Was this the first time you had seen such a big school or do the big fish normally run in packs throughout the year on Biwa? 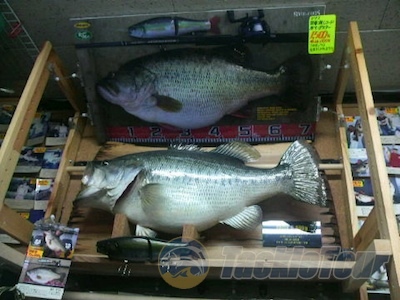 M.Kurita: I saw that school two weeks prior to catching the world record bass. I see schools like this 2 or 3 times a year with each school having around seven fish. 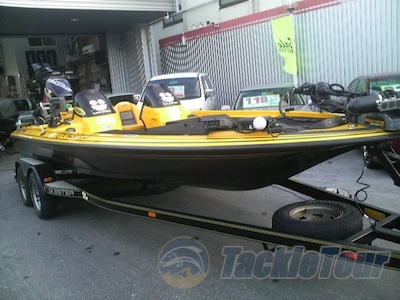 Deps Huge Custom 81RF, Daiwa Pluton and Deps Slide Swimmer 250. Next Section: How strong did the fish feel?